Analysis: Kendricks pleaded guilty to insider trading and will await his fate until further notice. The California product re-signed with the Seahawks this offseason on a one-year, $4 million contract. Kendricks could certainly miss the 2019 season due to jail time, and the team prepared for that, making his contract non-guaranteed. Kendricks likely would be in line for a rotational role in the Seahawks' linebacker corps, if eligible to play. Kendricks (lower leg) signed a one-year, $4 million contract with the Seahawks on Wednesday, Mike Garafolo of NFL Network reports. Analysis: Kendricks pleaded guilty to insider trading and is scheduled to be sentenced April 4, so his future with the Seahawks remains unclear despite re-signing with the team. The 28-year-old is expected to slot into a starting role if he's able to suit up in 2019 and could replace K.J. Wright at weak-side linebacker in the event Wright ultimately leaves in free agency. Kendricks (lower leg) has had his federal court sentencing date moved from Jan. 25 to April 4, Brady Henderson of ESPN.com reports. Kendricks (lower leg) was placed on injured reserve Wednesday, Brady Henderson of ESPN.com reports. Analysis: Kendricks was confirmed to have suffered a fractured tibia in Monday's win over the Vikings, and his placement on injured reserve officially brings an end to his season. The 28-year-old played in only four games prior to the injury due to suspension, totaling 20 tackles and two sacks for the season. Kendricks fractured his tibia in Monday's win over the Vikings and will miss the remainder of the season, Adam Schefter of ESPN reports. Analysis: It was originally believed after Monday's contest that Kendricks had sustained a knee injury, but follow-up exams revealed that the linebacker is dealing with a lower-leg issue. Kendricks, who returned from suspension to make his first appearance since Week 4, will now turn his focus to getting healthy ahead of the 2019 campaign. Austin Calitro will likely fill in for Kendricks at weak-side lienebacker the rest of the way. Coach Pete Carroll said Tuesday that Kendricks hurt his knee in Monday's game, and his status for Week 15 is uncertain, Gregg Bell of The Tacoma News Tribune reports. Analysis: Carroll would go on to say, "I don't know how he got through [the game]," suggesting that there is concern about the severity of the injury. Kendricks just had his eight-game suspension lifted Dec. 3 and racked up five tackles (two solo) in Monday night's game. It will be important to track his practice availability leading up to Sunday, but if he can't go, Jacob Martin could see an increased snap count. Kendricks (suspension) was reinstated to the Seahawks' active roster Monday, Adam Schefter of ESPN reports. Analysis: Kendricks could wind up playing a pivotal role down the stretch for Seattle. He's currently listed as a backup outside linebacker, but the Seahawks may use him as a change-of-pace edge rusher during passing downs. Despite his eight-game suspension, Kendricks was permitted to practice with Seattle beginning in mid-November. Kendricks (suspension) is permitted to participate in team practices and meetings as of Friday, Ian Rapoport of NFL Network reports. Analysis: Kendricks is still unable to take the field or travel with the Seahawks, but this is a step towards playing. The veteran linebacker received an eight-game suspension on Oct. 2, and he'll be eligible to return to the field on Dec. 10 against the Vikings. Kendricks pleaded guilty to insider trading and is still scheduled to be sentenced on Jan. 24, so his long-term position in Seattle will remain in serious jeopardy even if he resumes playing. 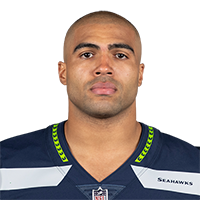 The NFL has suspended Kendricks for eight games for insider trading, Bob Condotta of the Seattle Times reports. Analysis: Kendricks was suspended indefinitely on Oct. 2, and because he'll get credit for time served, he'll be able return to action on Dec. 10 against the the Vikings. According to the report, Kendricks will be eligible to practice two weeks prior to that. The linebacker spent the offseason with the Browns before being released after pleading guilty to insider trading. He was signed by Seattle in mid-September and combined for 13 tackles and two sacks. The NFL suspended Kendricks indefinitely for insider trading Tuesday, Adam Schefter of ESPN reports. The NFL had deemed Kendricks, who is facing charges of insider trading, eligible to play Sunday versus the Cardinals, Bob Condotta of The Seattle Times reports. Analysis: There's no clear timeline for when the NFL will hear Kendricks' appeal of his suspension, so those relying on him in IDP formats should monitor his status each week. The 27-year-old linebacker has been solid through two games with the Seahawks, logging nine solo tackles, two sacks and one pass breakup. With K.J. Wright (knee) recovering slowly, expect Kendricks to handle a respectable workload in Week 4. Kendricks recorded six tackles, all solo, and a sack across 38 defensive reps in Sunday's loss to the Cowboys. Analysis: Kendricks was limited all week with an ankle injury, which could be the reason he only took the field for 62 percent of the team's defensive snaps. As he gets healthier and more comfortable in the new system, the veteran could see a higher snap count. Kendricks (ankle) is active for Sunday's game against the Cowboys. Analysis: Kendricks recorded three tackles, a sack and a pass defensed in his Seahawks debut in Week 2. Whether his ankle injury limits him against Dallas is to be determined. Kendricks (ankle) is expected to be available for Sunday's game against the Cowboys, Bob Condotta of The Seattle Times reports. Analysis: He'll first need to shake an ankle injury that made him limited during this week's practices, but coach Pete Carroll assured the media that the NFL deemed Kendricks eligible for Week 3. 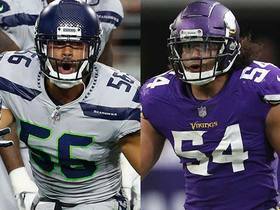 It's still unclear when the suspension will be handed down, but with Bobby Wagner returning from a groin injury, Kendricks will be needed less from now on. Still, expect Kendricks to log a hefty workload if K.J. Wright (knee) can't go again. 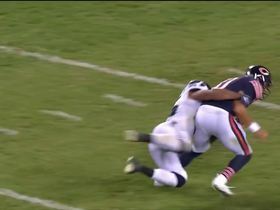 Kendricks totaled three tackles and a sack during Monday's 24-17 loss to the Bears. He also had a pass defense. Analysis: Kendricks -- who is currently appealing his suspension after pleading guilty to insider trading -- made an immediate impact in his first game for the Seahawks. The linebacker was on the field for 82 percent of the team's defensive snaps and will likely continue to see similar playing time until further notice. Kendricks was suspended by the NFL after pleading guilty to insider trading, but he'll play until the league hears his appeal, Adam Schefter of ESPN reports. Analysis: As expected, Kendricks will be able to play Monday against the Bears. He'll have his appeal heard within the next 10 days, but it's unlikely the suspension is lifted. Kendricks should be simply viewed as a rental at this time since the Seahawks need him to replace Bobby Wagner (groin) and K.J. Wright (knee), who are both listed as out this week. The team should give Kendricks a generous workload Week 2 with just five healthy linebackers. Seahawks coach Pete Carroll said that Kendricks "will play" in Monday's game against Chicago, Michael-Shawn Dugar of The Athletic reports. Analysis: Kendricks joined the Seahawks on Thursday after being released by Cleveland two weeks ago. It's unlikely that the linebacker sees extensive work after only having a couple days to practice prior to the upcoming Week 2 matchup with the Bears. Look for Kendricks to see limited snaps while he aims to increase his workload as the season wears on and his familiarity with the defense increases. Kendricks is signing a one-year deal with the Seahawks, Adam Schefter of ESPN reports. Analysis: Per Schefter, Kendricks is expected to play Monday night against the Bears. The seventh-year linebacker was released by the Browns in late August after being charged with insider trading. According to Brady Henderson of ESPN.com, Kendricks is not scheduled to receive sentencing for his crime until Jan. 24, leaving a sizable window for him to contribute to Seattle's defense. The Browns released Kendricks on Wednesday, Adam Schefter of ESPN reports. Analysis: Kendricks' dismissal from Cleveland is likely the least of his concerns at the moment considering the linebacker was charged Tuesday with insider trading. Even with Kendricks off the roster, the Browns still boast a deep linebacking corps with starters Jamie Collins, Joe Schobert and Christian Kirksey, though the quality of depth behind them is admittedly more questionable now. Kendricks is facing charges for insider trading, Ian Rapoport of NFL Network reports. Analysis: Kendricks released a statement saying he was misled by a former friend four years ago, but also acknowledged that he knew he was doing something wrong and intends to repay all the funds gained illegally. The NFL likely will review the situation under its personal-conduct policy, without much precedent existing for this type of situation. Signed to a one-year contract this offseason, Kendricks is expected to fill a key backup role as part of Cleveland's deep linebacker group. Kendricks (ankle) was back on the field Thursday, Nate Ulrich of the Akron Beacon Journal reports. Analysis: Kendricks -- who underwent offseason ankle surgery -- looks to be back at full health after sitting out minicamp. Signed as a free agent after spending the last six seasons in Philadelpha, the outside linebacker will see work behind Christian Kirksey. Kendricks (ankle) did not participate in mandatory minicamp, but head coach Hue Jackson expects the linebacker to be on the field for training camp, Pat McManamon of ESPN reports. Analysis: Kendricks is likely in recovery from March ankle surgery, so his absence for minicamp was likely expected even before Kendricks signed with Cleveland this past April. When healthy, Kendricks will play a key role in a strong Browns linebacking corps that otherwise includes Christian Kirksey and Jamie Collins at OLB. Kendricks (ankle) has agreed to terms on a one-year deal worth up to $3.5 million with the Browns, Mary Kay Cabot of Cleveland.com reports. Analysis: Kendricks was earlier rumored to have inked a deal with Cleveland, but ardently denied these murmurs when questioned. As it turns out, the seventh-year linebacker will end up with the Browns anyway and will reportedly start. The team already boasts a strong linebacker corps with Jamie Collins, Joe Schobert and Christian Kirksey, so it will be interesting to see how Kendricks fits into defensive coordinator Gregg Williams' scheme in 2018. Kendricks (ankle) has disputed the original report that he has agreed to terms with the Browns, Chris Tomasson of the St. Paul Pioneer Press reports. Analysis: Kendricks vehemently denied original reports that he had signed with Cleveland, stating that the news was inaccurate. For the moment, the veteran is unsigned, and it remains to be seen whether he will end up joining the Browns. Kendricks (ankle) signed a one-year contract with the Browns on Sunday, Ian Rapoport of NFL.com reports. Kendricks (ankle) was released by the Eagles on Tuesday, Adam Schefter of ESPN reports. 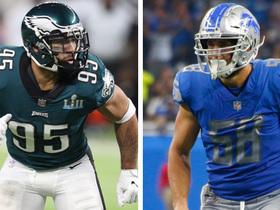 Analysis: After the Eagles have tried to trade away Kendricks each of the last two offseasons, the club has officially elected to just let the linebacker go in what appears to be a move to create additional cap space. Kendricks likely won't be out of work long, as he would be a valuable piece of any team's defensive front after posting 77 total tackles and two sacks in 2017. Brandon Brooks restructuring his contract may mean the Eagles keep Kendricks rather than trade or release him, Zack Rosenblatt of NJ.com reports. Kendricks underwent surgery on his ankle Thursday, Tim McManus of ESPN reports. Analysis: The procedure Kendricks underwent is described as a "clean-up" that should only sideline him for a few weeks. As a result, the linebacker should be back on his feet in time for the start of the Eagles' offseason workout program next month. Kendricks posted 77 total tackles (55 solo), two sacks and six passes defensed across 15 games during the 2017 regular season. Kendricks (foot) is active for Monday's contest against the Raiders, Tim McManus of ESPN.com reports. Analysis: Kendricks followed a limited/full/full practice regimen this week but still received a questionable designation for this contest. Given the all-clear to play Week 16, the weakside linebacker will seek out a fruitful outing versus Oakland's 22nd-ranked offense. Kendricks has drawn a questionable designation ahead of Monday's game against the Raiders due to a foot injury, Jeff McLane of The Philadelphia Inquirer reports. Analysis: Kendricks was absent from the injury report throughout the week, so it is unclear when he picked up the injury. Kamu Grugier-Hill would likely fill in at weakside linebacker should Kendricks ultimately sit out. Final confirmation on his status is unlikely until closer to kickoff Monday. Kendricks recorded nine tackles (eight solo) during the Eagles' Week 15 victory over the Giants. Analysis: Kendricks' tackle total tied his second highest output on the season. All of his production came across 61 defensive snaps (69.0 percent). The 27-year-old outside linebacker will look to carry his momentum into the Eagles' Week 16 matchup versus the Raiders. 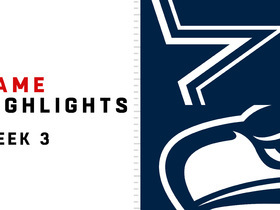 Kendricks made nine tackles (four solo) in Sunday's loss to the Seahawks. Analysis: The tackle total was his highest since Week 6 at Carolina, and he hadn't exceeded four in any of his previous three contests. He is not a recommended IDP option in Week 14 against a Rams offense that does not give up many points to linebackers. 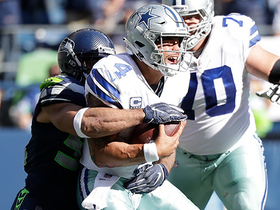 Seattle Seahawks linebacker Mychal Kendricks sacks Dallas Cowboys quarterback Dak Prescott in Week 3 of the 2018 season. 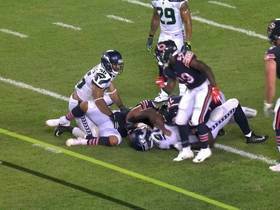 Seattle Seahawks linebacker Mychal Kendricks sacks Chicago Bears quarterback Mitchell Trubisky in Week 2 of 2018. 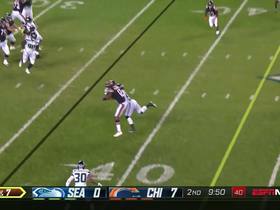 Seatlle Seahawks linebacker Mychal Kendricks breaks up pass and stares down Chicago Bears wide receiver Allen Robinson. 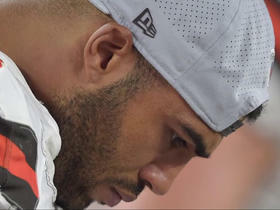 NFL Network Insider Ian Rapoport reports the latest on Cleveland Browns linebacker Mychal Kendricks, who has been charged with insider trading, and explains what this could mean and what kind of punishment could result. 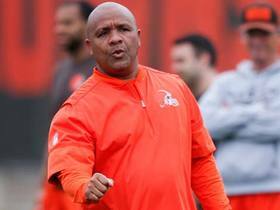 NFL Network's Steve Wyche explains how the Cleveland Browns offseason additions have fit into their scheme so far through the team's minicamp. The Philadelphia Eagles have released linebacker Mychal Kendricks and lost LB Paul Worrilow to a torn ACL. 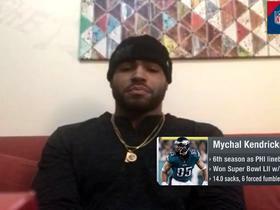 Philadelphia Eagles Linebacker and Super Bowl LII champion Mychal Kendricks joins 'NFL Total Access' to talk about his team's Super Bowl-winning season and more.